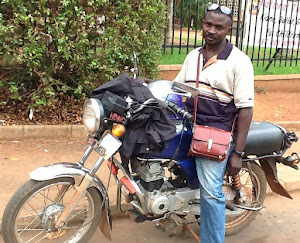 Bodaboda Baby: The glamorous and unglamorous side of riding a boda. 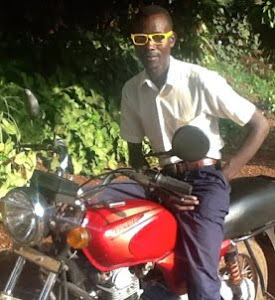 The glamorous and unglamorous side of riding a boda. 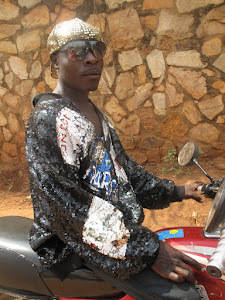 Check him out, a totally "pimped-out" boda, in the words of Hillary Heuler, who found him. Pics: Hillary Heuler. 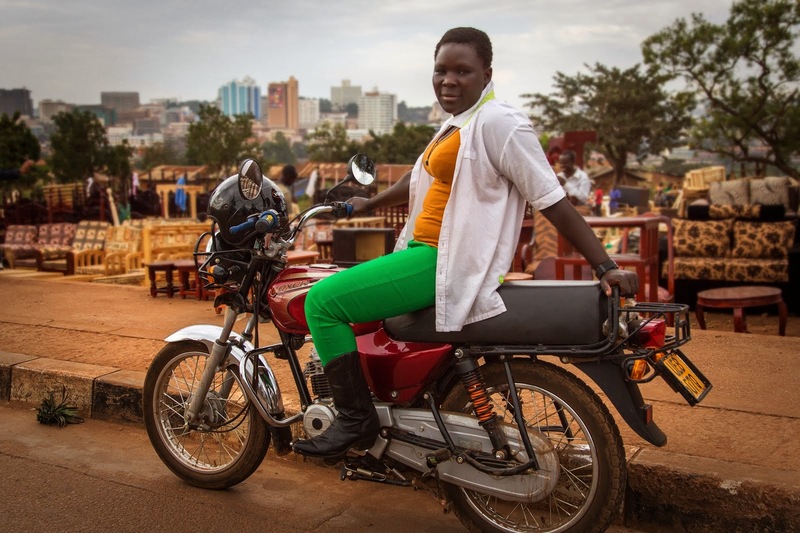 There's a glamorous side to driving a boda in Uganda (if we can call it that) and an unglamorous side (may be a bit of an understatement), and Bodaboda Baby has seen both of these, as the photos below show, over the past few weeks in Kampala. 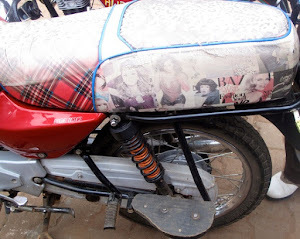 Thanks to good friend and brilliant journalist Hillary Heuler, for sending in these pics illustrating the former - a bike complete with fake rabbit fur (glad it's fake, although what would Anna Wintour say?) 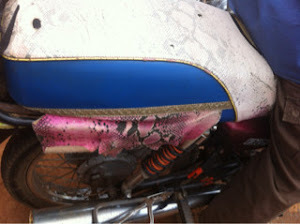 Note the pink bit of carpet on the engine. Check out the helmet which says Fire Base (apparently this is a Bobi Wine song - anyone heard it?) 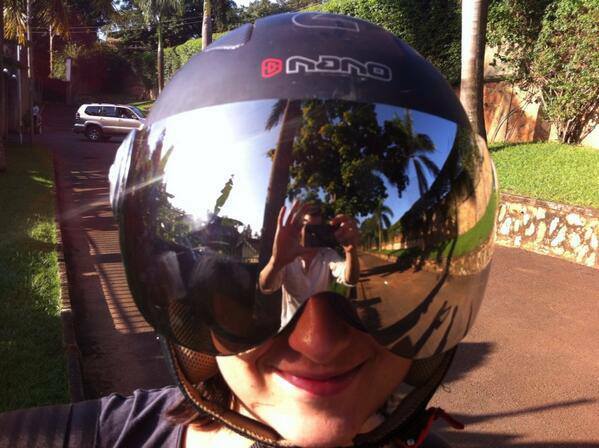 And I thought Hilary Heuler's own helmet, which she spray painted herself, was hip enough. Isn't that your carpet? Check out the handlebars. 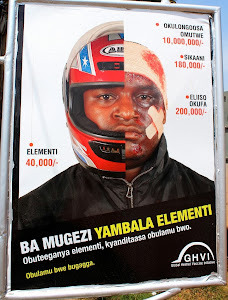 The unglamorous side of riding a boda in Uganda can be seen in these new billboards below, apparently known locally as "road stars" (anyone know why they call they them that?) erected across the city in hot spots such as Wandegeya by the Uganda Helmet Vaccine Initiative (UHVI). Uganda Helmet Vaccine Initiative, a local NGO, has recently erected these billboards and "road stars" across Kampala. 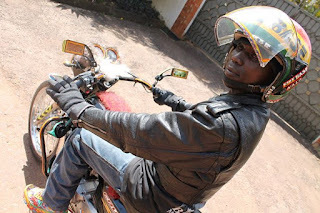 According this really well-written and informative report by Ugandan science journalist Esther Nakkazi, Injury Control Center, a local NGO, said there were five to 20 boda-related cases every day at Mulago hospital - 7,280 cases a year in Kampala alone. 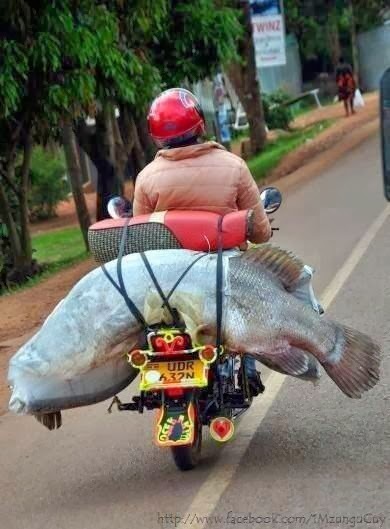 Meanwhile 570 boda drivers died in 2011, a local traffic report found, although these figures are likely to be higher UHVI say. 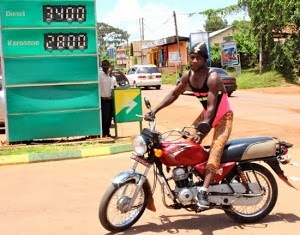 Not to bog readers down with stats, but according to the Uganda Police Annual Crime and Traffic/Road Safety Report 2011, there were 22,272 traffic accidents in Uganda in 2011, 8,743 of them involving motorcycles. 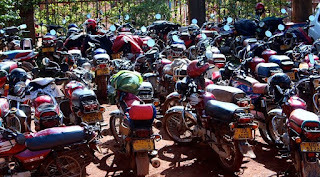 The boda industry, they warn, will soon be the leading cause of deaths and traffic-related injuries in the country, but streamlining them requires efforts “far beyond” what the force can offer. 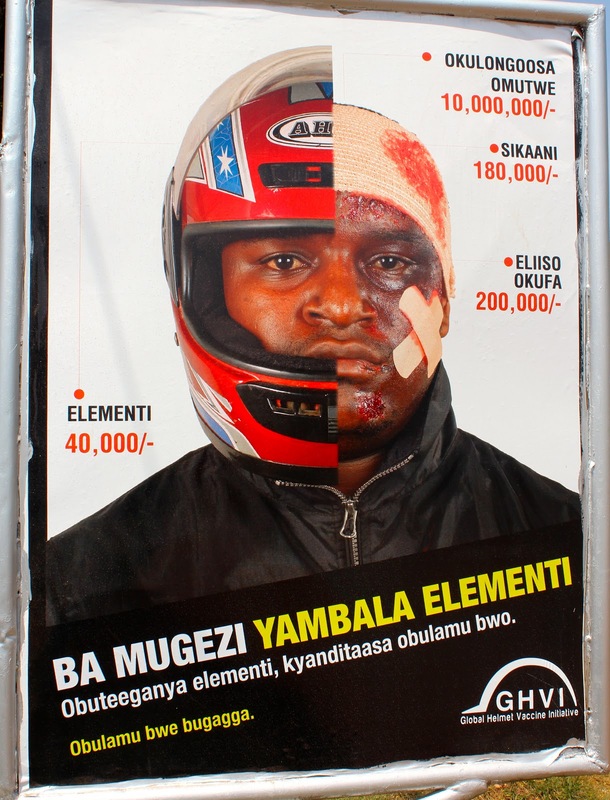 With the Luganda words "Obulamu bwe bugagga" - "your life is your wealth" - written on the billboards, UHVI is trying to persuade Kampala's hundreds of thousands of drivers to wear a helmet while on the road so they can stay safe and continue earning a living for themselves and their families. 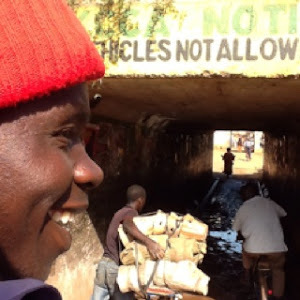 "These are people that are really working for hand to mouth, like the money I make today is the money I’ll actually use to feed my family tonight," country director Barbara Mwanje explained. "Then tomorrow is a fresh day." 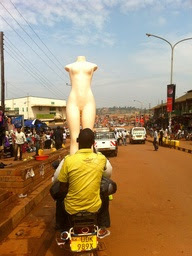 A "road star" has been put up at a boda stage at Wandegeya. 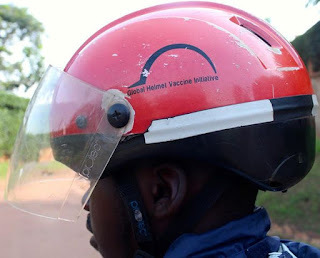 UHVI, a local branch of Global Helmet Vaccine Initiative, have been working in Uganda for three years. They have Bobi Wine as a Goodwill Ambassador. 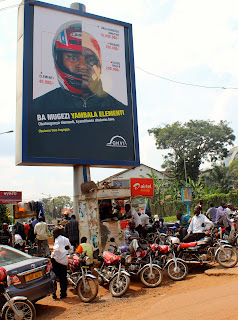 Besides rolling out the billboards across the capital, their ad has started running on three Kampala radio station. 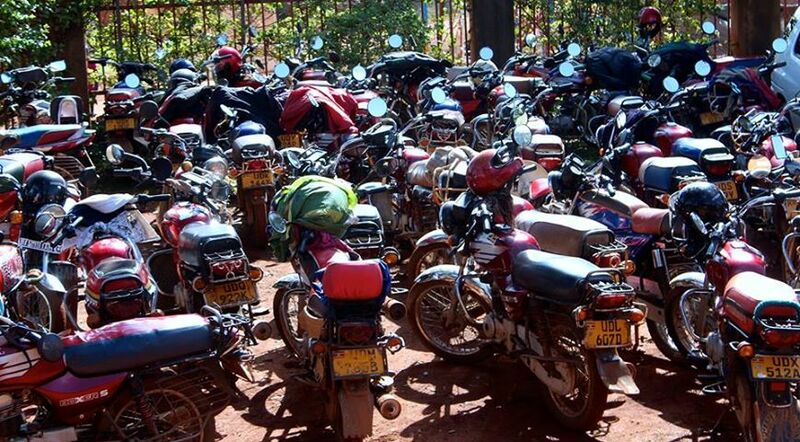 They've also been holding safety training workshops for boda riders in Kampala. So far they've trained 1,800 riders, who are selected through their local divisions. The day begins with riders completing a survey, which includes questions on helmet use. They repeat this at the end of the day to see what they've learnt. Drivers also watch safety demonstrations on a projector and do exercises in pairs. "We observe these riders pre-workshop and post-workshop, two months after the workshop. 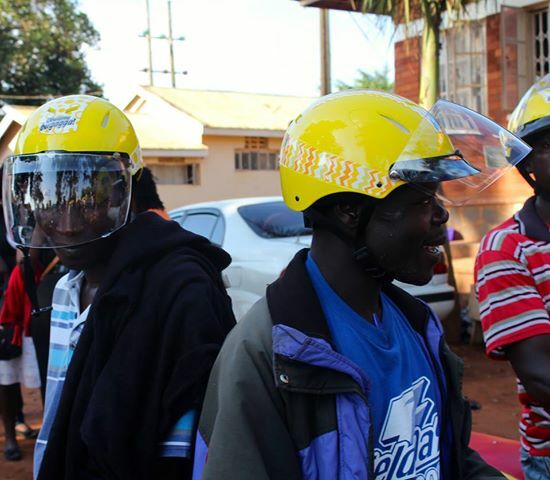 We want to understand is there a change in behavior after they’ve been to the training and they’ve been given a helmet," said Barbara. When Bodaboda Baby visited this stage to take a photo of the UHVI sign, many riders said they'd already heard about the workshops and asked how they could attend. 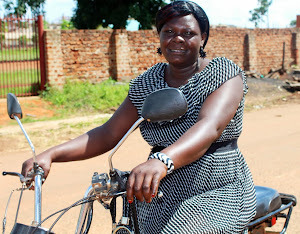 She said before UHVI intervened in Kampala stages last year helmet use was at 38 per cent. Three months later it was up to 55 per cent. 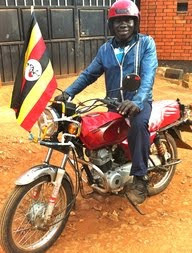 Boda drivers are given a transport allowance, an incentive to attend the safety training workshops. "They show up and you find they're very focused throughout the day and excited to be here," said Barbara. 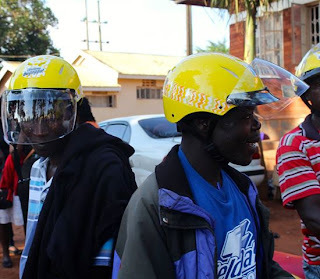 UHVI holds safety training workshops for boda riders, which end in these shiny helmets being given out for free. Bodaboda Baby had wondered how all these helmets ended up on the streets of Kampala, after snapping this one in Munyonyo in March. 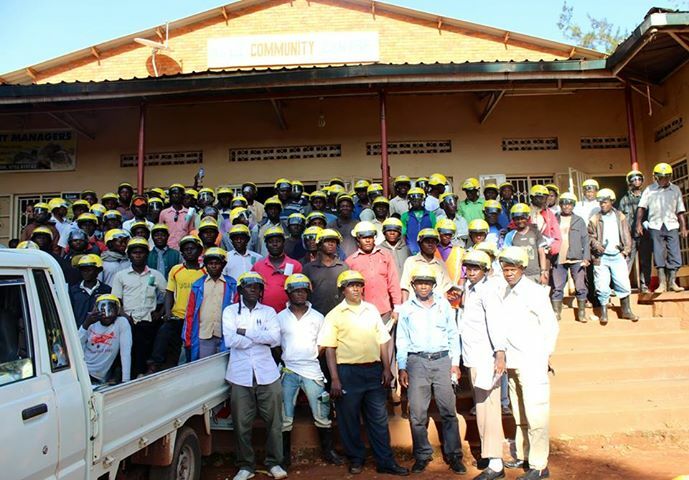 The day culminates in each participant being given a new, shiny canary yellow helmet. "In the beginning (of the workshops) they found out they got the helmets at the end, but then the word spread," said Barbara. The white inner part of the helmet - the most important part as it absorbs the impact from a crash - is made from EPS or polystyrene, a very dense form that we know of from Styrofoam food containers, according to Lotte Brondum, International Development Director of Asia Injury Prevention Foundation, who is based in Hanoi. The outer shell – the yellow part- is made from plastic called ABS. 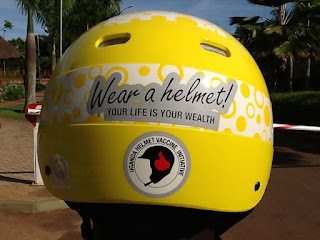 The helmets are produced in Vietnam at AIP Foundation's non-profit factory Protec, where interestingly up to 30 per cent of the workforce have disabilities. 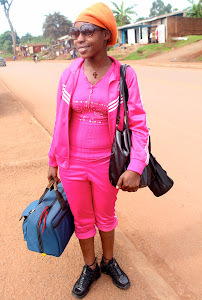 Bodaboda Baby attended a UHVI workshop a couple of weeks ago in St Joseph's Community Hall Mulago - coincidentally on the same day as visiting the neurosurgery section of Mulago Hospital, where she met many boda-related victims. She cannot describe the sheer jubilation - and the tooting, and the showing off - among the bodas, from the Kawempe division of Kampala, at the end of the workshop when the free headwear was given out. Where is everyone - out to lunch? Never! They're just doing their safety training. There was much posing and strutting when these helmets were given out at a UHVI workshop recently. 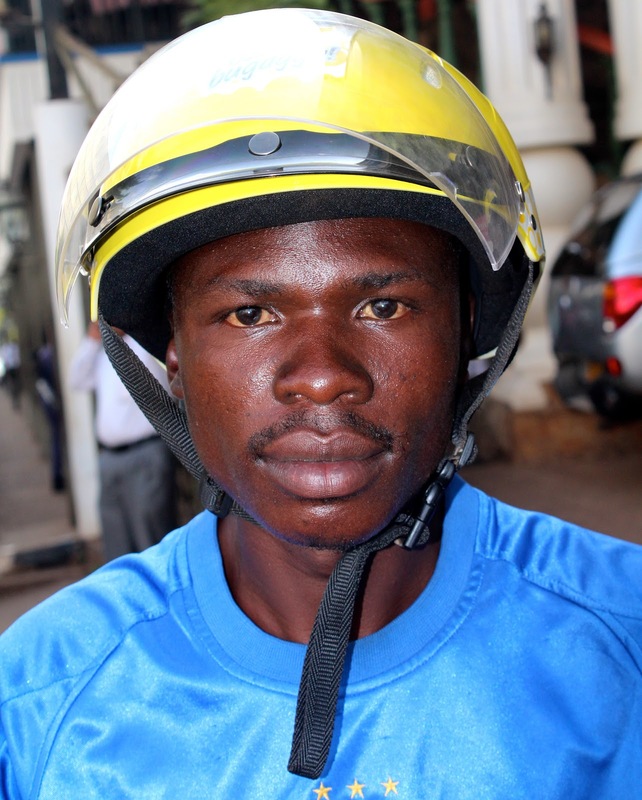 A collision with another boda and a hospital stay didn’t convince Ronald Katetemera, 27, a driver of three years to buy a helmet. After today’s training he says he won’t take his new headgear off. 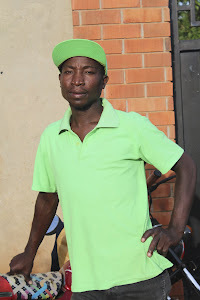 “Everyday it’s going to be my first clothes," he said. “They say life has no money value. “I don’t want to die because I have my children." 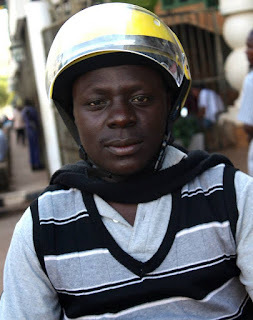 Boda driver Ronald was very excited to see his new helmet. I'm still in touch with one rider, Michael, and pleased to report he's wearing his helmet - there have been some reports of some attendees trying to flog theirs for sale. 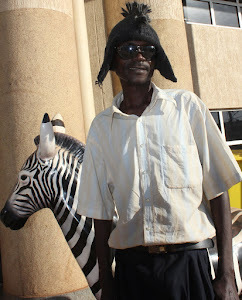 Michael has also me to church with him this Sunday, advising me to come with "captivez (captives?) and demonz possessed". I wouldn't have it any other way. 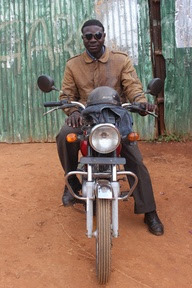 Boda driver Michael sporting his new helmet. 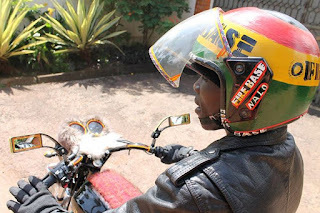 Besides the yellow UHVI on the streets of Kla, which make Uganda even sunnier, there's the elusive red GHVI helmet, harder to find. 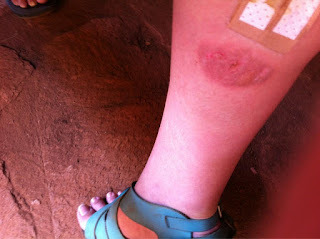 Although the author of this blog did meet a rider wearing it, the day after the UHVI workshop. Winning. 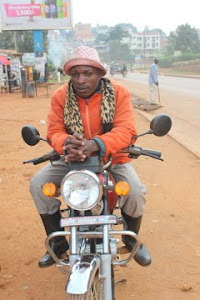 Boda driver Roger, whose stage is in Muyenga, sporting his red GHVI helmet. 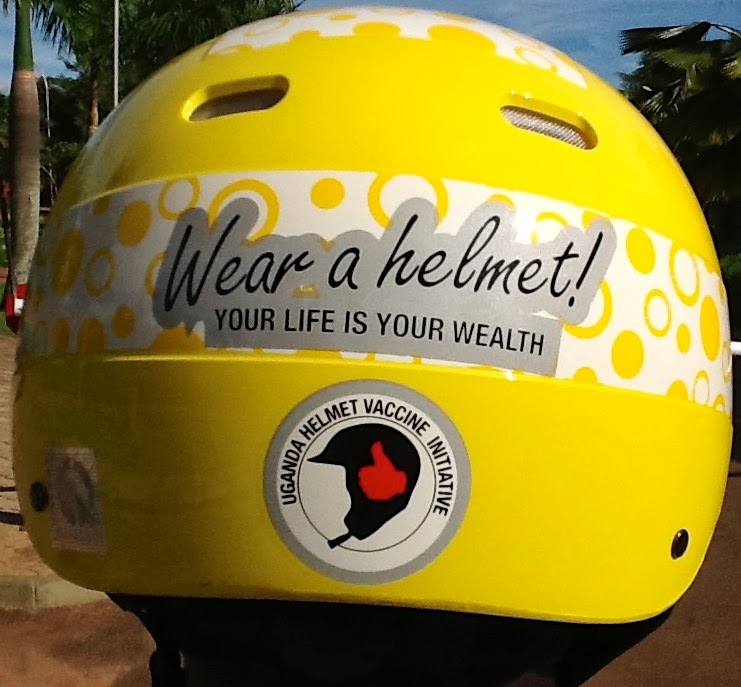 UHVI says it would love to do more to spread the word about wearing helmets on the road, if they secure more funding. "It’s not right that they continue to die and become seriously injured. Something has to happen for them, for the passengers that they carry, for the mess in the city," said Barbara. 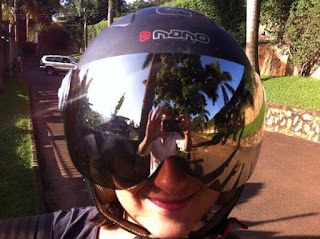 There'll be more on the UHVI and Bodaboda Baby's trip to Mulago Hospital on this blog later, but while we're on the topic of helmet compliance, Anna Kucma has sent in this great pic of herself wearing her vintage helmet which she picked up at a Green Shop in Kampala. Yours truly nearly jumped her for it when she first saw it and is still jealous, but is working to overcome this. Thanks to Anna Kucma and Will Boase for this great snap. 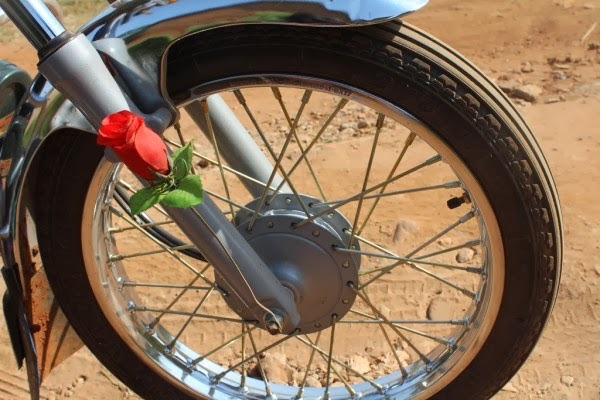 Although the main injuries sustained in motorbike crashes in Uganda are head injuries, it's important to also look after your legs - the author of this blog knows this after her two boda accidents. 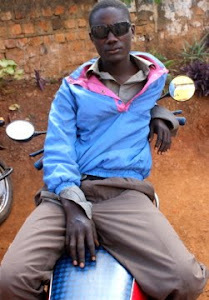 Poor mzungu in Uganda, Catherine Warner sustained a nasty injury to one of her limbs, see below, after having a boda accident recently. Pass the iodine (but don't become addicted). Pic courtesy of Catherine Warner. Sidenote: noce shoes. 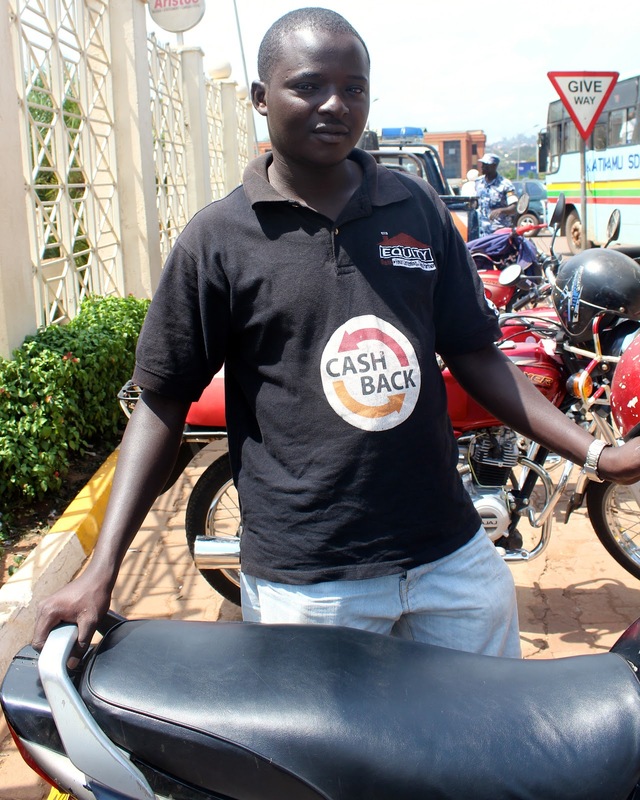 But if, as a passenger, you are injured in an accident perhaps you could ask for a "cash back?" One Garden City boda driver, see below, appeared to be offering this last week, but alas when Bodaboda Baby enquired, it was too good to be true. Customer "cash back?" I wish!